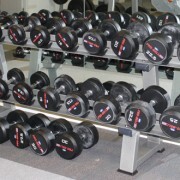 We can offer these remarkable entry level gym dumbbells as individual pairs, prices weights below, (ex shipping). Well balanced attractive Dumbbells Engineered by Pro-Bell. Superior Pro-Bell construction locks heads in place on central contoured handle. 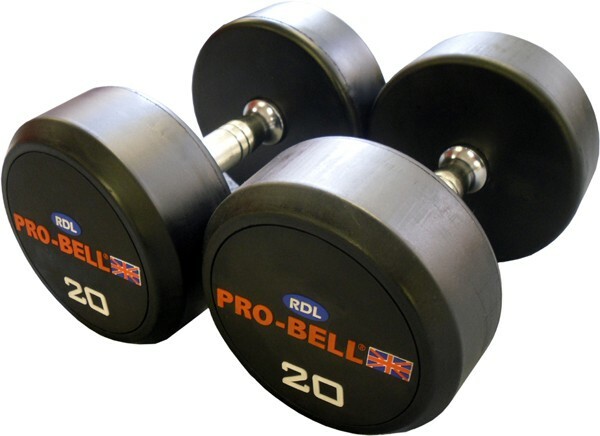 The Pro-Bell RDL tm Dumbbells are fabricated from rubber over a central metal core. The rubber exterior provides excellent durability while preventing chipping / damage to benches/machines and reducing noise in the gym free weights area. The Pro-Bell RDL tm Individual Dumbbell Pairs are both satisfying to use and appealing to the eye. 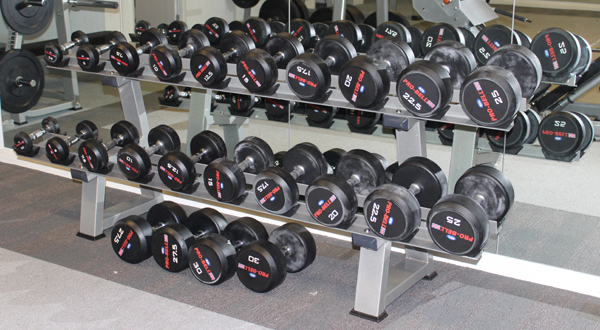 These modern dumbbells are exceptionally stylish and WILL look the part in all modern gyms. 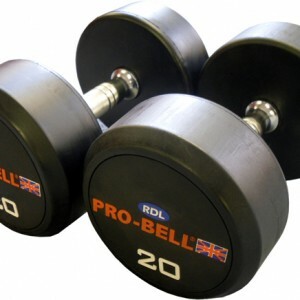 Features include Ergonomic High Quality knurled Chrome Handles which make the Pro-Bell RDL tm dumbbells a joy to use. Pro-Bell have engineered the new RDL range for entry level commercial gym usage. The design utilises a dual head locking mechanism to prevent head/handle separation and incorporate large easily seen moulded weight markings for easy identification. The Dumbbell heads themselves are smooth single piece making them low maintenance and easy to clean. Also See The Pro-Bell RSC and USC for further increased durability in demanding environments and further resistance to abuse. Please call or email to discuss your requirements, where a member of our sales team will be happy to discuss your requirements.